Oh, that agonizing snap of metal, and you know immediately that your car or house key has just broken off and become lodged inside the keyhole. Over time, locks wear out. When this happens, putting any amount of pressure onto the key to turn it is all it takes to break it off. Now, you’re left with a broken key and a lock that cannot be used because a key is jammed inside. Worse yet, if the key is broken off into the lock, it is possible for a crook to get it to turn and gain access to your home or car. You can go the Do-It-Yourself route, or you can save a bunch of time and effort by just calling a locksmith now. To make sure this doesn’t happen to you, it’s a good idea to every so often look over your keys before inserting them into the locks to make sure they are strong enough for use. If you park your car outside during winter months, never force a key into a frozen lock. Another precaution is to lubricate your locks often. The concept of extracting a jammed key is fairly simple but it does take some know-how and skill. If you choose to first go the Do-It-Yourself route, spray the lock with WD40 or Pam spray lubricant to ease the jammed key out of the lock. Another step to try is to place a piece of a saw blade into the key hole very carefully so as not to damage the lock, the door or yourself. Once the broken off jammed key is loosened, grab the key shaft tightly until it is pried loose. Grab a hold of the key shaft by turning. Once you see that you’ve got a grip on the key, try to release the shaft from the lock as much as you can to extract it with a pair of tweezers or nail clippers. Once the key is dislodged, hang onto the two pieces so a professional locksmith will be able to make a new key replacement. 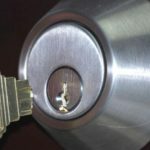 In the end, if your DIY attempts don’t work, or if you just want to save yourself the time and headache of attempting to extract the key yourself, call a locksmith Chandler. If you don’t feel comfortable attempting a broken key extraction yourself, it’s time to call in a locksmith. A qualified and experienced locksmith Chandler is able to show up and get you and your key out of a jam in no time at all. When all else fails, or to save yourself the headache, call a locksmith for your broken key extraction needs.